Surface Characterization provides an authoritative guide to the wide range of powerful techniques that are used to characterize the surfaces of materials. Practical in approach, it not only describes the major analytical techniques but emphasizes how they can be used to solve a multitude of chemical and physical problems. A special feature of the book is that the various techniques are grouped according to the material property under investigation. These parts are preceded by an overview comparing the capabilities of the characterization methods available. Extensive data tables allow the reader to assess rapidly the strengths as well as the pitfalls inherent in each method. Chapters on chemical composition, optical and crystallographic properties, microtopography, surface processes, tribological, electrical and magnetic properties of surface films are featured. In addition, chapters specializing on applications within the life sciences on the microscopic scale and chemometrics are included. Surface Characterization is addressed to both academic and industrial audiences. Scientists and engineers working on the production and development of new materials will find it an invaluable reference source. Physicist, chemists, chemical engineers, material scientists and engineers from every area of materials research will benefit from the wealth of practical advice the book provides. 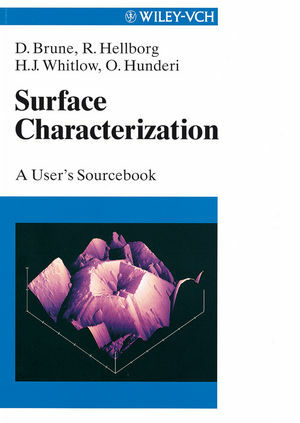 Dag Brune is the editor of Surface Characterization: A User's Sourcebook, published by Wiley. Ragnar Hellborg is the editor of Surface Characterization: A User's Sourcebook, published by Wiley. This new book is providing an authoritative guide to the wide range of powerful techniques that are used to characterize the surfaces of the materials. It can be used as a reference guide for scientists and engineers from a broad range of disciplines within the metallurgy as well as materials technologies.